Shiny, Brand New Second Edition! The Second Edition of “A Project Guide to UX Design” is available now! User experience design is the discipline of creating a useful and usable Web site or application–one that’s easily navigated and meets the needs of both the site owner and its users. But there’s a lot more to successful UX design than knowing the latest Web technologies or design trends: It takes diplomacy, project management skills, and business savvy. That’s where this book comes in. 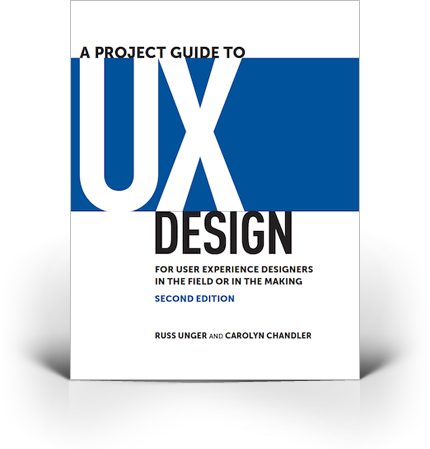 Authors Russ Unger and Carolyn Chandler show you how to integrate UX principles into your project from start to finish. This updated and expanded edition contains information on contracts, content strategy, sketching, prototyping with HTML5/CSS3, research, facilitating and workshops, as well as mobile and gestural applications. When we have updates or additional content, we will notify you as soon as it goes live.